Press release from ERA/FoE Nigeria. The Environmental Rights Action/Friends of the Earth Nigeria (ERA/FoEN) has hailed a Dutch appeals court ruling today (Friday December 18, 2015) which affirmed that Shell parent company could be held liable for oil spills at its Nigerian subsidiary, urging other Niger Delta communities to institute similar action against the company for years of pollution. The court decision overturns a ruling by a lower court in 2013, which said the parent company could not be held liable. Four farmers and fishermen, backed by Friends of the Earth, first filed the case against Shell in the Netherlands in 2008, demanding a clean up oil spills in their communities, prevention of further spills and payment of compensation for the ruins caused by Shell. In January 2013 a lower Dutch court threw out most of the lawsuit, saying the communities could not hold Shell’s parent company in Netherlands responsible for the pollution which has for years ruined their environment. At the time, the judges said Shell’s Nigerian subsidiary was partly responsible and ordered it to compensate farmers and fishermen in one claim, in Ikot Ada Udo in Akwa Ibom State, but not in the three other claims from Oruma community and Goi in Bayelsa and Rivers respectively. In the ruling today, the court said that the farmers may take their case against Shell to a judge in the Netherlands, meaning Dutch courts have jurisdiction in the case against Shell and its subsidiary in Nigeria. It was delivered by Judge Hans van der Klooster at the appeals court in The Hague. ERA/FoEN Executive Director, Godwin Uyi Ojo said: “Today we have recorded yet another victory for communities that have been under the yoke of Shell. This ruling sets a landmark precedent that opens the doors for impacted communities to sue Shell in Netherlands for the negligence of its subsidiaries in their part of the world”. In 2008, four Nigerian citizens – Friday Alfred Akpan from Ikot Ada Udo, Eric Dooh from Goi and Alali Efanga en Fidelis Oguru from Oruma- together with Friends of the Earth Netherlands took Shell to court over oil spills that had polluted their fields and their fish farming ponds. Once proud owners of flourishing farms, they were now reduced to poverty and forced to survive on odd jobs, because the oil spills were never properly cleaned up and their land and fish ponds remain unusable to this day. The plaintiffs demand that Shell cleans up the oil spills, compensates them for their losses and prevents new leakages by ensuring that the company’s pipelines are properly maintained and patrolled. Friends of the Earth Netherlands is a co-plaintiff. The case of the four Nigerian farmers is only the tip of the iceberg. For decades, Nigeria has been the stage of the largest oil spill on earth. Over the years, an amount of oil double to that of the sinking of the Deep Horizon in the Gulf of Mexico in 2010 has leaked into the environment. 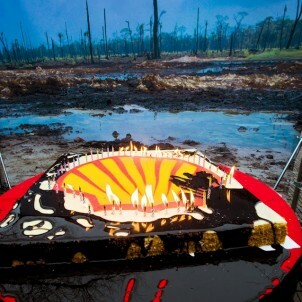 A 2011 report published by UNEP – the environmental organisation of the United Nations – shows Shell doing far too little to clean up the leaked oil.